"Knowingly and willfully placing the gratification of his personal ambition above the interests of the public and the rights of litigants." 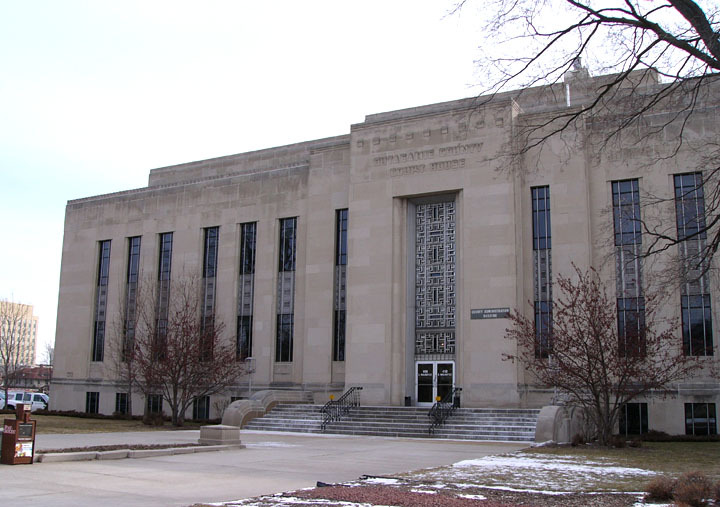 Following his graduation from the law school of Marquette University, Milwaukee, McCarthy began his legal career in Waupaca, Wis., in 1935. Less than a year later he left Waupaca to become associated in Shawano, Wis., with Mike Eberlein, a prominent Republican lawyer, although McCarthy had already identified himself as a Democrat. This was the year the Democrats were riding high with the New Deal. McCarthy decided to cling to his Democratic Party affiliations for a while. In August, 1936, he was elected president of the Young Democratic Clubs of Wisconsin’s Seventh District, which includes eleven counties. Shortly afterward he announced his candidacy for district attorney of Shawano County on the Democratic ticket. McCarthy was defeated, and thereafter never ran as a Democrat. In 1939 McCarthy, aged 29, announced his candidacy for judge of the Tenth Judicial Circuit, which includes Shawano, Outagamie, and Langlade Counties. The announcement of his candidacy came as a staggering blow to his senior partner and benefactor, Mike Eberlein, who had had his heart set on running for the circuit judgeship in that district. Greatly saddened by the experience, Eberlein decided against running but announced that the young McCarthy and he were no longer associated in the practice of law. "He made few speeches, but he met every farmer in the district. His specialty was sick cows. He would get the cow’s symptoms, drive on to the next farm and ask the farmer what he would do for a cow with those symptoms. He kept a dictaphone in his car, and as he drove away he would dictate a letter to the first farmer, giving the second farmer’s advice as Joe’s own. Both farmers would be flattered by this attention." McCarthy served about four years altogether as a Wisconsin circuit judge. In 1941 he gained considerable state-wide attention when the Wisconsin Supreme Court sharply rebuked him for improper conduct on the bench. Marvin B. Rosenberry, highly respected Chief Justice of the Wisconsin Supreme Court, on June 18, 1941, wrote the sharp criticism of McCarthy for the Court. Justice Rosenberry said that McCarthy had committed an "abuse of judicial power," had been "highly improper" in ordering the destruction of a portion of the record, and had, in general, created a "regrettable state of affairs." This sharp denunciation of Judge McCarthy resulted from a case in which the State Department of Agriculture had asked the court Nov. 4, 1940, to force the Quaker Dairy of Appleton to obey the state marketing law. Although the law was not to expire until Dec. 31, 1941, Judge McCarthy dismissed the case in June, 1941, after a number of postponements. The State appealed to the Supreme Court, where it was quickly discovered that an important statement made by McCarthy in dismissing the action was missing. Judge McCarthy explained he had ordered the statements destroyed by the court reporter. The Wisconsin Supreme Court unanimously found McCarthy’s actions an abuse of judicial power. "We are cited no authority and we find none which justifies a court in suspending the operation of a statute on the ground that it will work a hardship if it is enforced," the Court said. "It must be concluded that the grounds upon which the trial court [McCarthy] acted did not constitute a sufficient or proper legal reason therefore and that this action constituted an abuse of judicial power." Moreover, the Court found, "a judicial officer is required to administer the law without respect to persons so long as it is enforced. Any other course would constitute an infringement upon the powers and functions of the legislature, interfere with the operation of agencies . . . and result in advantage to persons who disobey the law." The Court sharply criticized McCarthy for having ordered the destruction of notes he had dictated during the case—notes on which he had based his "improper" ruling. lic denunciation of McCarthy during his career as a judge, as the report below of the case State of Wisconsin v. Joseph R. McCarthy makes clear. Meanwhile, when McCarthy returned from his wartime service (See Pages 9-11) he early decided to build a political machine around the Young Republicans of the state. At about this time, McCarthy, the judicial records of Wisconsin show, began to grant "quickie" divorces to couples not resident in his judicial district. The records show that in several cases one of the principals, or the attorney, or both were active in supporting McCarthy’s political ambitions, sometimes with cash. "Is Wisconsin justice to be used to accommodate political supporters of a presiding judge? Are Wisconsin courts the place in which to settle political debts?" The editorial concluded that "Judge McCarthy, whose burning ambition for political advancement is accompanied by an astonishing disregard for things ethical and traditional, is doing serious injury to the judiciary of this state." But the most severe attack on McCarthy's legal and judicial ethics came as a result of his decision to run for the U.S. Senate in 1946 while still sitting as a circuit judge. McCarthy’s term as Circuit Judge did not end until December, 1951. He ran for Senator in 1946—five years before his judicial term was to expire. McCarthy defeated Robert M. LaFollette, Jr., for the Republican nomination by a vote of 207,935 to 202,557—a margin of 5,378 votes. While the campaign was in progress, the Wisconsin Supreme Court was asked to bar McCarthy from the ballot because of the Wisconsin constitutional ban on judges running for political office during their term on the bench. The Wisconsin Supreme Court concluded, however, that it had no jurisdiction in this case because it was a federal office that McCarthy was seeking in running for U.S. Senator. The Supreme Court made it clear, however, that if McCarthy were runing for governor or another state office, his votes would have been thrown out and his candidacy disqualified. In 1949 the State Board of Bar Commissioners, the official state body governing the conduct of lawyers, asked the Wisconsin Supreme Court to take disciplinary action against McCarthy for "violating the public policy of the State of Wisconsin, the Code of Judicial Ethics, his Oath of Office as Judge, and his Oath of Office as a Member of the Bar." "It is difficult to conceive of any conduct upon the part of a presiding judge which would bring judges into greater disrepute and contempt than the conduct of the defendant [McCarthy] challenged in this proceeding. "The defendant [McCarthy], by his conduct, chose to defy the rules of ethical conduct prescribed by the Constitution, the laws of the State of Wisconsin, and the members of the profession in order to attain a selfish personal advantage. "The gratification of his ambition was in defiance of the declared policy and laws of Wisconsin. .
"The breach of official trust and obligation is as great when applied to a candidate for the office of United States Senator as it would be if applied to one for governor of the state. "Under the facts of this case we can reach no other conclusion than that the defendant [McCarthy], by accepting and holding the office of United States Senator during the term for which he was elected Circuit Judge, did so in violation of the terms of the Constitution and laws of the State of Wisconsin, and in so doing violated his oath as a Circuit Judge and as an attorney of law." McCarthy angrily demanded the resignation of the entire Board of Bar Commissioners because it dared to petition the Supreme Court for disciplinary action, but no one took this seriously. The branding of McCarthy as a lawbreaker and mocker of the Constitution he had sworn to uphold was the last official mark on McCarthy’s career in Wisconsin as he moved on to the U.S. Senate. Before we turn to a study of McCarthy’s career in the Senate we pause to examine briefly the story of his wartime service in the Marines.